Soares e Filhos coach in the Rua da Restauração, Oporto, July 2001. Caima: Runs a modern fleet. Empresa Marques: operate from their base at Viseu, to the south-east of Oporto. This is a very scenic route which originates beside the Renex office on the corner of the Rua da Restauração (city-centre end). Viseu coach station is a large, modern facility where many regional operators can be seen, such as Guedes. Espírito Santo: run local services centred on Vila Nova de Gaia. Grijó: Runs services to the south of Oporto. Joalto: Operate to northern towns including Viseu. Rede d'Entre Douro e Minho: As its name implies, this company operates services predominantly into the area north and east of Oporto. Renex: Rede Nacional de Expressos run services to many cities in Portugal, including Lisbon and Coimbra. Rodonorte: Operate a wide range of routes in northern Portugal. 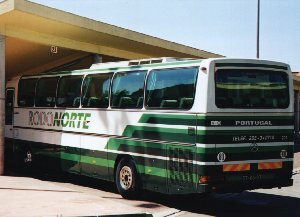 João Carlos Soares e Filhos: operate coaches to and from towns to the north of Oporto, especially Guimarães and Vila do Conde. The company is part of the Arriva Portugal group. 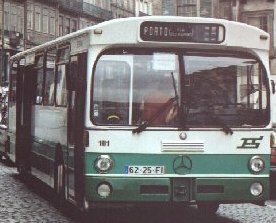 Arriva arrived in Portugal in November 2000 when it purchased Ami-Transportes S.A., João Carlos Soares & Filhos SA and Viação Costa Lino SA. It provides inter-urban services in N.W. Portugal and in all employs 340 staff. Its fleet comprises 180 buses with the main depots being in Braga and Guimarães. In December 2000, Arriva also acquired the Abílio de Costa Moreira company, based in Famalicão. L to R: Viseu-based operator, Marques, runs services to and from Oporto; Espírito Santo operates short-distance services around Oporto and Gaia. 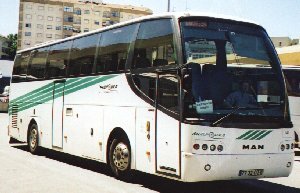 There are numerous independent coach operators with services into Oporto and they operate a wide range of vehicles. This page just mentions a few of those which may be observed. Amongst the many starting points for coach services are the following. As of summer 2001 some services are relocated due to Metro construction works. Garagem Atlântico, Rua Alexandre Herculano. This lies just off the Praça de Batalha, conveniently close to the upper level of the Ponte D. Luís. It is therefore much used by routes running south, across the Douro, via Vila Nova de Gaia. Rua da Restauração. Services park alongisde the Renex booking office at the city (upper) end of the Rua da Restauração.